The absolute greatest indulgence in the world for an author is to have an opportunity to connect with her readers. It is a thrill unlike anything else, and so far, in these last 64 days, I have heard from readers in a variety of ways. Some people have called me. These readers, of course, are friends and family. As it turns out, this is as thrilling for them as it is for me because, typically, they aren’t able to finish reading a book, then pick up the phone to call the author with a question. Other readers have been in touch by reviewing the book on Amazon or Goodreads or Barnes and Noble. Some readers have asked me questions on my Goodreads page or started to follow my blog and have left comments there. That’s where I recently heard from a reader from Portland, Oregon . . .
She had chosen THE MEMORY BOX for her book club and the meeting was going to be in a few days and she was eager to find discussion questions. If you read the book, you’re probably thinking what I was thinking. She hadn’t finished it yet. This actually reminded me of myself. I’m always reading the book club book the weekend before the meeting. Anyway, she was relieved to hear that the suggested questions were listed in the back of the book. (We had a good laugh about this later!) I also told her that her group was the first book club to read THE MEMORY BOX and that I’d love to join their discussion of the book. This flipped her out. They never had an author join them at a book club meeting. Who has? But I can tell you, this was a mutual treat! She decided this was so exciting that she wasn’t going to tell any of the members beforehand. She wanted it to be a surprise for the night they were discussing the book. Since I appeared via Face Time, I wasn’t able to hear her tell everyone before I was “live,” but I can tell you I was as ecstatic as they were. In retrospect, it makes complete sense to me that people love to hear the back story of the story. How did you come up with the idea? Why did Caroline make certain decisions? What is your writing process? Why didn’t so-and-so tell the police about so-and-so? (Sorry, can’t reveal that specific question, but it was a good one! In fact, I hadn’t ever thought about it before — they really stumped me.) And they asked the question that I seem to be getting a lot these days, will there be a sequel? If you had asked me that question 65 days ago, I would have said no. But now, I just might reconsider. More on that to come. Thank you, Dunthorpe Book Junkies! I am so lucky to have you as readers. By the way, that’s a photo of them above. For everyone else out there in the world, if you choose THE MEMORY BOX for your book club, please let me know. I’ve heard from many of you who have scheduled it for your September, October and November (you peeps are good planners!) meetings. So, thank you! And, absolutely send me a photo of your group with the book and I’d love to post it here. If I’m available to chat with you and your group via Face Time or Skype, if you’d like, I’ll make every effort. But if I can’t, do let me know about your meeting, I’d love to hear from you! Looks like Maine hasn’t caused you to lose contact with your readers. I love the photo and look forward to seeing more. 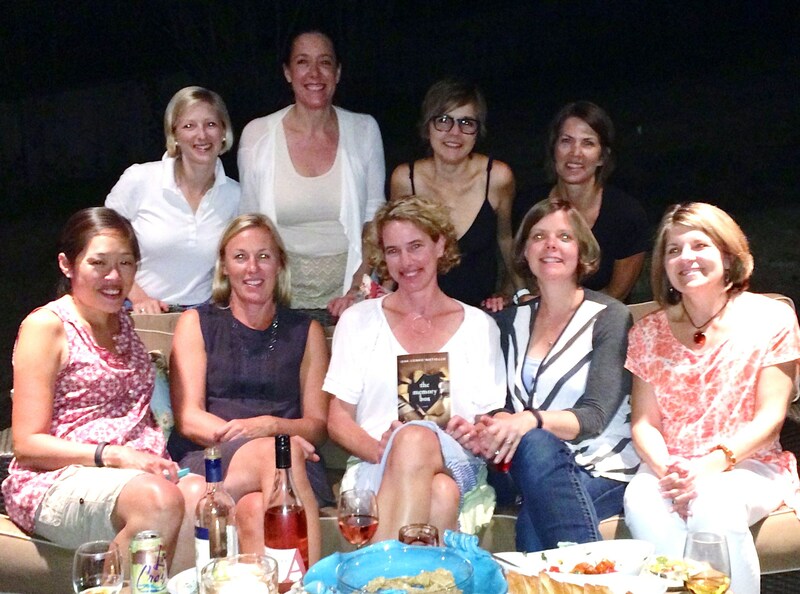 It’s a great visual reminder of how a book can bring people together….how wonderful that The Memory Box is finding its way into book groups across the country. Previous Previous post: Where in the World is THE MEMORY BOX? ?